If talking with your boss makes you nervous, try thinking of him or her as a mentor instead of evaluator. (CareerBuilder.com) -- By the very nature of their position, bosses often make people edgy. "When you consider the number of resources a boss has control over -- from your job assignment and performance review to whether or not you're going to make your next rent payment -- it's easy to understand why you can get nervous in their presence," says Kerry Patterson, co-author of the New York Times best-seller "Crucial Conversations." "If things go wrong, bosses can make your life miserable." Letting nerves get the best of you, however, can cause what Ed Muzio -- CEO of Group Harmonics in Albuquerque, N.M., and author of "Make Work Great" and "Four Secrets to Liking Your Work" -- calls an "emotional doom loop." "You worry that even a small mistake or misstatement will carry serious and unpredictable consequences. Nervousness leads to worry, which leads to reduced focus, which leads to a greater chance for error and thus more nervousness. 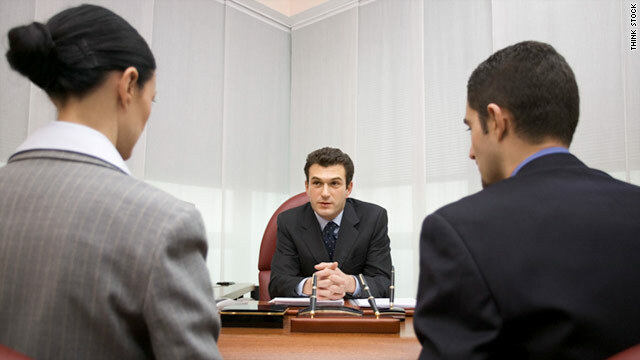 For many, an audience with a VP or CEO can be nearly crippling." "Don't wait for your boss to tell you what's important," says Lynne Eisaguirre, workplace consultant and author of "We Need to Talk: Tough Conversations with Your Boss." "Ask your boss where you should focus your energies. Make specific requests and ask specific questions until you are clear about what he wants." Practice your responses to situations and questions that make you nervous until they become second nature. "Rehearsal goes beyond preparation, research and knowledge, all of which are prerequisites. It requires that you actually make your presentation aloud, in advance, multiple times," Muzio states. "When your anxiety comes, you will fall back on your muscle memory and perform well anyway. Sure, you can't practice every possible interaction, but if your rehearsal helps you to manage your first few waves of anxiety, you may find that things get easier." While it may be temporarily therapeutic to let off steam with co-workers, getting a reputation as a complainer is not to your long-term advantage. Worrying if what you said around the water cooler might get back to your boss is only going to make looking him in the eye that much harder. Ease comes with familiarity, so spend more informal time around your boss. Eisaguirre suggests asking him to coffee or lunch to get a better sense of what he values and fears. "It takes courage, but it will pay off." "Bosses can provide helpful information regarding what it takes to succeed, and they love to play the role of mentor," Patterson says. "Spending time in career discussions helps remove the power from your relationship -- transforming your boss from evaluator to mentor and helper." Likewise, this willing-to-learn attitude can help defuse potentially volatile situations. "When your boss criticizes your work, ask for detailed information about what's wrong. Suggest possible solutions or ask for ideas -- don't immediately defend your position. Asking for additional information is the ultimate sign that you're confident in your work and your ability to solve problems," Patterson says. Negative experiences with former supervisors can cloud current relationships, putting you on edge around someone who is perfectly pleasant and professional. "You can't change the power difference between you and your boss, but you can address your level of trust," Muzio notes. "Seek situations in which your boss has a legitimate opportunity to make a commitment and deliver upon it -- whether it's to you or to someone else -- and then take time to notice whether or not he follows through. If you begin to see your boss as someone who behaves predictably and ethically, your trust will improve and your nervousness will decrease." Lastly, it may sound like the simplest advice, but it may be the most powerful: Be a good employee. Confidence comes with positive experiences, and positive experiences come from hard work and preparation. Do your job well and there's nothing to fear when interacting with your boss, including fear itself.